I love doing wedding make-up. It is such a momentous occasion, emotions running high and a significant event in a person's life. To be preparing someone for that event is really special, requires a lot of trust and a fine balance of support, calm, patience and sometimes an assertive word "the look we agreed on that is going to make you look most beautiful today was... "
Very occasionally on a job do I get nervous, generally, I thrive under pressure. BUT, if time is really short, there are tears on cheeks or if tensions are high, I admit, I do get nervous. 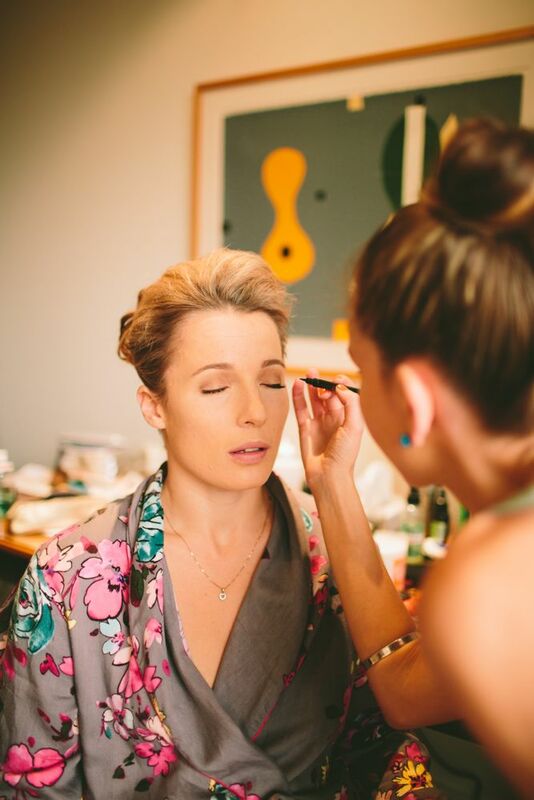 ...and as it so happens, I also get nervous doing my best friend's make-up on her wedding day. I mean, really nervous. Unexpectedly so. Because Ruby lives in Melbourne, we did not a chance to trial her bridal make-up. Her style icon - Grace Kelly. Flawless skin, contoured cheeks with a touch of colour, strong feminine brows, soft neutral eyes with some irresistible lashes (and a liquid lined-eye just for definition). She really did look timeless and beautiful. Sharing what you love, with the people you love - really is a blessed existence.